Raymarine has launched a new series of apps which enable users to control e and c-Series multifunction displays wirelessly from a smartphone or tablet. These two new apps – RayRemote and RayControl – are now available for Apple iOS, Android and Kindle Fire. 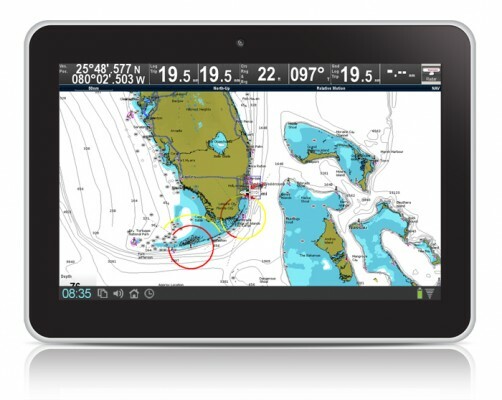 RayControl transforms tablets into both a viewer and a full-function 2 way control; the tablet syncs with the multifunction display and users touch the tablet screen to control the MFD; pulling up charts, operating radar and thermal cameras, selecting menus, setting waypoints etc. in the same way as operating the MFD direct. RayControl also features a ‘pop-out’ virtual keypad mirroring the multifunction display’s rotary controller and hard keys, enabling users to operate all available functions wirelessly and remotely. RayControl works with all Raymarine’s new e Series and c Series multifunction displays. RayRemote is designed for use on smartphones, switching their smaller screens between a full screen MFD repeater display and a full screen virtual keypad with just a tap of the display. The complete virtual keypad mimics that found on the multifunction display, including cursor and rotary controls, allowing users to navigate features, rotate through menus, and make adjustments easily. RayRemote works with all Raymarine’s new e Series and c Series multifunction displays. Thanks to the new e and c Series wi-fi connectivity, a single multifunction display can support multiple wireless control devices, such as a smartphone using RayRemote, and a tablet using RayControl. The RayControl app will even enable the new c-Series display to be operated via touch; the menu system, apps and other features can be touch controlled via the RayControl app on tablet. The new RayControl and RayRemote apps are a welcome and much anticipated addition to the existing free RayView app. RayControl and RayRemote are available for Apple iOS, Android and Kindle Fire, and can be purchased via the Apple iTunes App store, Google Play Store for Android, and through the Amazon Android Marketplace. Pioneers in all aspects of infrared technology, FLIR designs, manufactures, and supports thermal imaging systems and subsystems for industrial, scientific, government, commercial, and firefighting applications. With almost 50-years of history in infrared innovation, over 100,000 systems in use worldwide, and development centres and sales offices in over 60 countries, FLIR is the world leader in thermal imaging technology. Visit the company’s website at www.FLIR.com.